Every year on Thanksgiving Day, the same scene plays out on countless American dinner tables. You score with the holiday bird’s thigh meat (so moist and juicy) but its breast, most unfortunately, is a dry and stringy epic fail. Thank goodness for gravy. Or maybe it’s the reverse. The breast meat carves into tender, magical slices, but the thighs and drumsticks, which your dark meat-loving family members always fight over, are overly pink and rubbery to the touch. Everyone has to wait while you pop the pieces back into the oven for additional roasting. 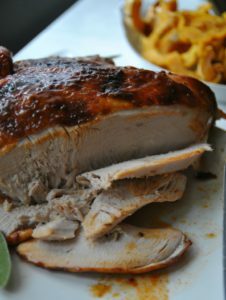 For a dish that seems like it should be so easy, a properly cooked Thanksgiving turkey actually requires some fussing over, what with the white meat always cooking faster than the dark meat, no matter how carefully you tent it when the breast hits 150 degrees on an instant-read thermometer. No wonder so many of us count hassle-free sides like stuffing and candied sweet potatoes among our favorite holiday dishes. Break the bird down into parts to be cooked individually, or buy your turkey legs and a breast separately from the get-go, and you solve the problem. White and dark cook on their own terms, and as a result, no one gets stuck with over- or under-cooked poultry. There are other reasons it makes sense to cook a turkey in parts instead of an entire bird during the holidays. Perhaps you hate the way a 15-pound turkey takes up so much room in the oven, making it difficult to cook more than one or two side dishes at the same time. Or maybe you simply want to spend more time socializing and less time hunched over a hot oven taking the bird’s temperature. A whole turkey can take upwards of three or more hours to roast (longer if it’s stuffed). 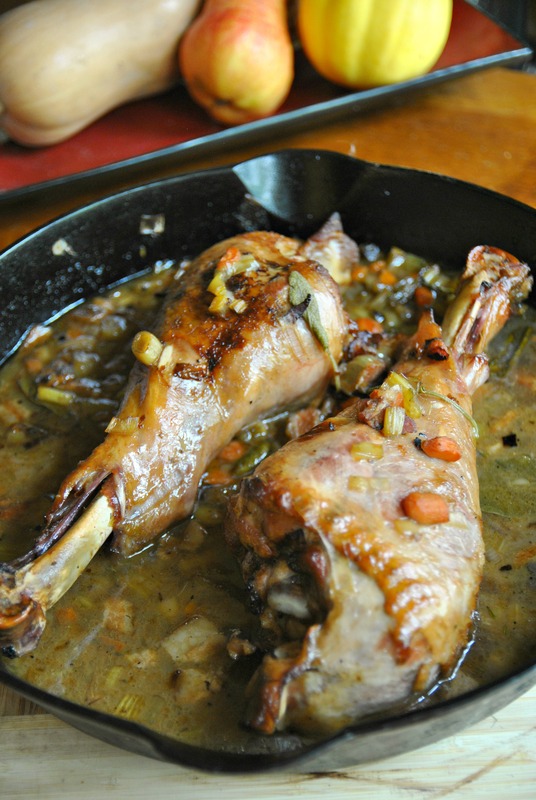 Braised drumsticks only take about 90 minutes, while a whole breast only needs about two hours. Plus, turkey parts generally don’t require a whole lot of knife skills to slice the meat off the bone. While finding turkey legs could be a challenge (I found mine at Wholey’s; frozen turkey legs are sold at Strip District Meats in the Strip District), most larger grocery stores sell frozen turkey breasts year-round. As we get closer to Thanksgiving, you’ll also be able to find fresh turkey at such specialty shops as DJ’s Butcher Block in Bloomfield, and Marty’s Market in the Strip District, as well as from poultry farmers such as Pounds’ Turkey Farm in Leechburg and Serenity Hill Farms in Cheswick. How to proceed? You can roast the turkey parts in the same pan at 350 degrees, after rubbing them with butter, salt, pepper and herbs (add the turkey legs after the breast has been in the oven for 30 minutes). Or give them more personal attention and a bit more style with recipes such as the Maple Syrup-Mustard Glazed Turkey Breast or Cider-Braised Turkey Legs. Either one would be a tasty and stress-free addition to your Thanksgiving table. It takes some planning, but brining your turkey makes the meat super-moist and tender. This easy recipe is flavored with apple cider and maple syrup. I used a half breast (about 3 pounds) and it turned out great. For brine: In pot large enough to hold the turkey breast comfortably, combine 2 quarts water with cider, maple syrup, thyme, bay leaves, salt and orange quarters. Bring just to a simmer. Add 2 quarts ice water (about half ice/half water). Let come to room temperature. Submerge turkey in brine, cover and refrigerate overnight or all day (about 12 hours). Preheat oven to 400 degrees. Arrange a rack in large roasting pan (a V-neck roasting rack is ideal, but any rack will work). Remove turkey from brine, rinse well and pat dry. Loosen skin off turkey breast with fingers and rub butter under the breast skin. In small bowl, stir together paprika, dry mustard, sage, granulated garlic and pepper and rub all over the turkey breast. Set turkey on rack breast side up and roast for 30 minutes. Meanwhile, in small bowl, stir together maple syrup and mustard. After 30 minutes, reduce oven temperature to 325 degrees and brush turkey with some of the glaze. Continue to roast, basting twice more, until meat thermometer inserted into the thickest part of breast reads 165 degrees, about 1½ hours, depending on the size of breast. Let turkey rest on cutting board for 15 minutes before carving. Any leg person will love this braised turkey recipe. Note that turkey legs are big. In fact they are so big that I couldn’t fit them in my Dutch oven and had to use a 16-inch cast-iron skillet. The sauce is so tasty; save it to spoon over rice or potatoes. Rinse and dry turkey legs; season on all sides with salt and pepper. Set aside. Place bacon in a large Dutch oven and cook, stirring occasionally, over medium heat until bacon begins to crisp, 3 to 5 minutes. Using a slotted spoon, transfer bacon to a paper towel-lined plate and set aside. Increase heat to high and add olive oil. Add turkey legs, skin side down, working in batches if necessary. Cook, turning, until turkey is browned on all sides, about 5 minutes per side. Transfer legs to a plate and discard all but 1 tablespoon of rendered fat from Dutch oven. Add carrots, celery, and leeks to Dutch oven and cook, stirring, until golden brown, about 5 minutes. Add brown sugar and cook until it begins to bubble. Add thyme, sage, bay leaves, and cider; bring to a boil and stir, breaking up any browned bits at the bottom of pan. Continue boiling until cider is reduced by half, about 5 minutes. Add chicken stock and bring to a boil; reduce heat to a slow simmer and add reserved bacon. Return turkey legs to the Dutch oven, skin side down; cover and transfer to oven. Cook for 40 minutes, turn turkey legs, uncover, and continue cooking until legs are tender and starting to fall off the bone, 45 to 50 minutes more. Transfer turkey legs to a serving platter. Skim fat from top of braising liquid and discard; season braising liquid with salt and pepper and spoon over turkey legs. Serve immediately.